PALM SPRINGS, Calif. ~ The POWER improved to 11-5 in conference with an 8-1 victory Tuesday night, thanks in large part to an outstanding effort on the mound from St. Mary’s right-hander Jonathan Buckley. Buckley tossed seven innings of near-shutout ball, only allowing an RBI single to Bulldogs centerfielder Brandon Galindo in the second inning. While Buckley’s nine strikeouts and one walk helped in the victory, the POWER offense was in sync tonight with RBI contributions from Casey Combs (East Texas Baptist University), Ben Nisle (Purdue), Austin Reyes (Santa Clara University), Dillon Sears (Western Illinois) and John Mauldin (University of New Orleans). The sixth would be the biggest inning on offense for the POWER as they plated three runs after chasing Bulldogs’ starting pitcher Colby Childs when he allowed Andrew Penner (Cal State Bakersfield) and Mauldin to reach on back-to-back hits. POWER reliever Chad Boudreaux (East Texas Baptist University) held it down in his inning of work in the eighth after the Bulldogs came calling with a walk and a single to start the frame. Boudreaux would force some bad contact and get out of the jam, allowing usual POWER starter Jacob Corn (Spartanburg Methodist) to shut the door on the Bulldogs in the ninth, in order. The POWER won this one 8-1, their sixth straight win. 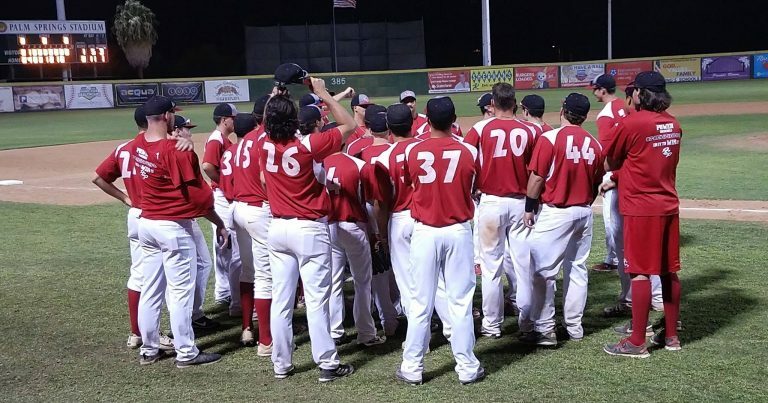 The POWER will look to continue their success tomorrow night against the Palm Springs Collegiate League All-Stars on the 4th of July! Tickets are still available at the ticket booth for the game at 6:05 PM and the fireworks show following the game. Gates will open at 4:30 PM, so be sure to get here early to get a good seat! Parking is available on a first come, first serve basis for $5 a spot. Additional parking is available in the Pavilion lot once our stadium lot is full. For more information, call our office at (760) 778-HITS.